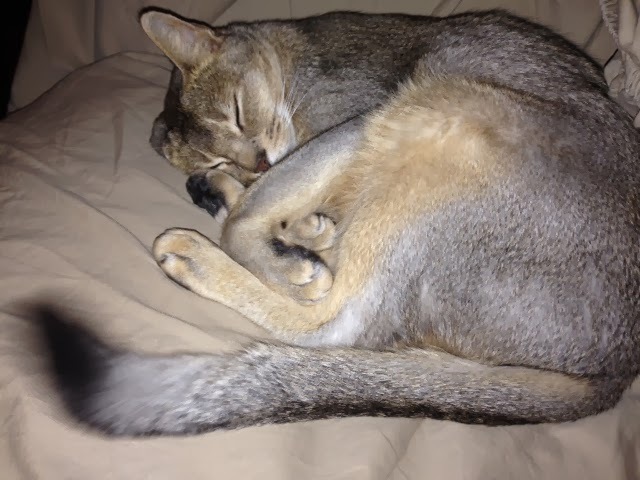 An Abyssinian cat and his accessories. "Walter? Who is he? Oh. These are his 3-month shorts? Then, how do I fit them? I am 7 years old, and I weigh 9.2 lbs. How much is Walter going to weigh? Oh. We will wear the same size? At least I have a new bassinet out of this whole thing. Oh. Walter's bassinet. Well, I still wear the pants in this family." Does this make my cone look big? Loves Daddy, Loves to Dance. In spite his dutifully good manners and slight sashay, Ishmael knows how to be a feral beast. Sometimes it is him swiping a neatly tied beef tenderloin ($57) off the counter and then letting the blood drip down his chin as he swings it from side to side. But, more often, he runs around proudly with a piece of "can I have a little to-go bag for my cat?" tuna sashimi hanging out of his mouth or an Ishmael-size portion of the center of Mommy's ribeye. 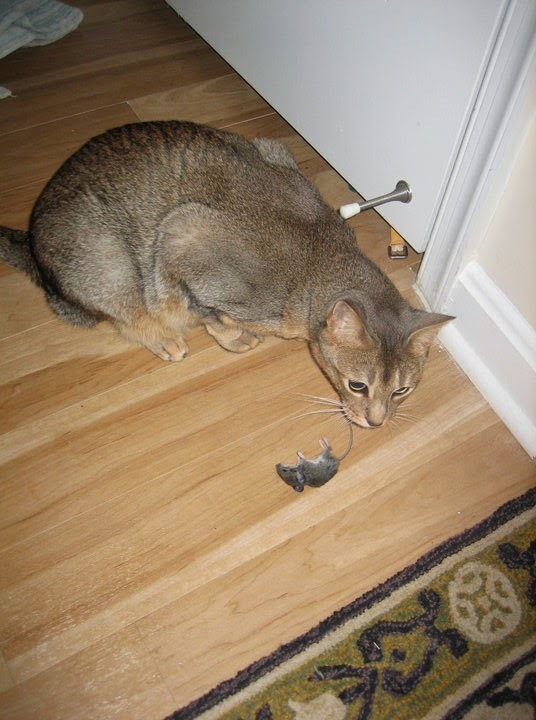 Twice, however, he's had the joy of hunting and killing a mouse and then playing "keep my [prize] away from Mommy." 1. Hiding the mouse under the ottoman and then sauntering casually away as if nothing's happened. 2. Maniacally throwing the mouse into the air and then swinging his arm like a bat about 5 times in a row. 3. Attacking Mommy like a wildebeest with no recognition of the parental-cat bond in hopes of keeping the [prize] for a little bit longer. Wait, what? There is a mouse by my bottom? Last night Daddy called me his little pepper steak. Then, I had a little lick from his toothbrush. Too far, Ishmael, too far. Ishmael missed Daddy so much while Daddy was on his business trip. Now, let's get back to our business, he says. Ishmael loves his new paperwhite. In fact, it's Daddy's paperwhite. Mommy must have taught Ishmael about sharing. Tuesdays get to be too much for Ishamel. Later, he'll trade one of the sad songs for a damp washcloth and a blowout. Daddy told Mommy that I was the equivalent of roughly 4 to 6 cats. "That's right, old man," I said. 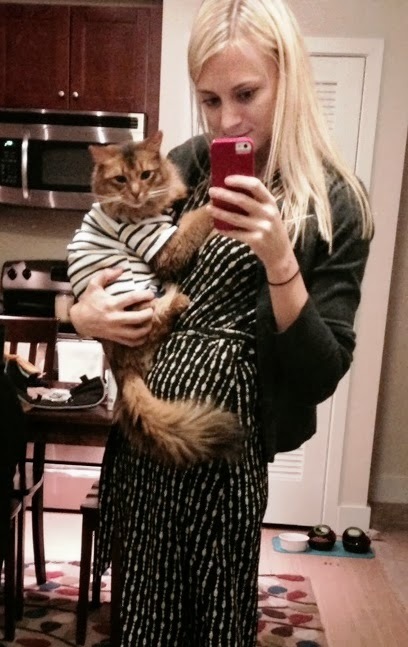 Since finding out about the arrival of his human baby brother in 20 weeks, Ishmael has taken up a new hobby. This was his first selection. Mom's Hero, a.k.a. King of the Castle, Lord of the Tail, Got Ruff? I do my puzzle. I lay in the box. 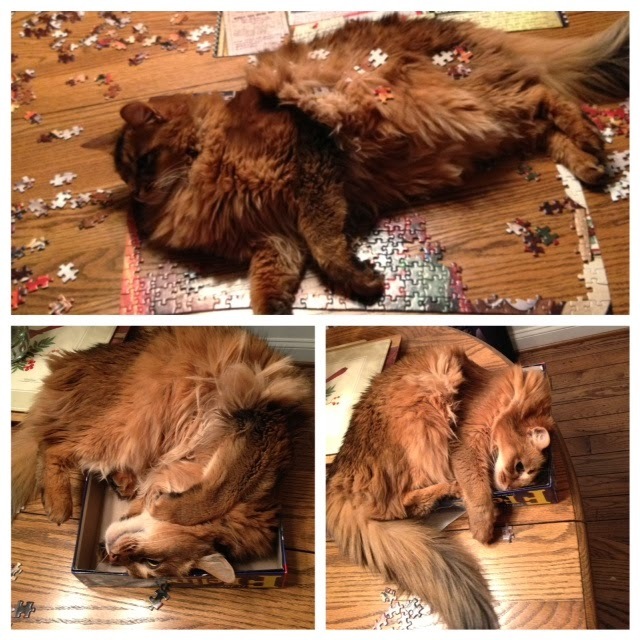 Oh, your puzzle? Yes, I do your puzzle. I lay in my box. 1. Come in; I sit on your lap. 2. You will not lock me out. This is my time. 3. If you don't let me sit on your lap, I practice my spins and twirls at your feet while I sing my sad sad songs. 4. If you hush me or refuse to pet me, I make toilet paper confetti. 5. I help you pet me by grabbing your hands with my hands. 6. Before you leave, please put me on the scale. My ideal weight is 9.2 pounds. 7. I drink out of the toilet on occasion, but you are not to observe me. It's the "found water" concept, and you need to respect the hunt. Just a reminder: the Baltimore Ravens are Super Bowl Football Champions of the World for 8 more days. 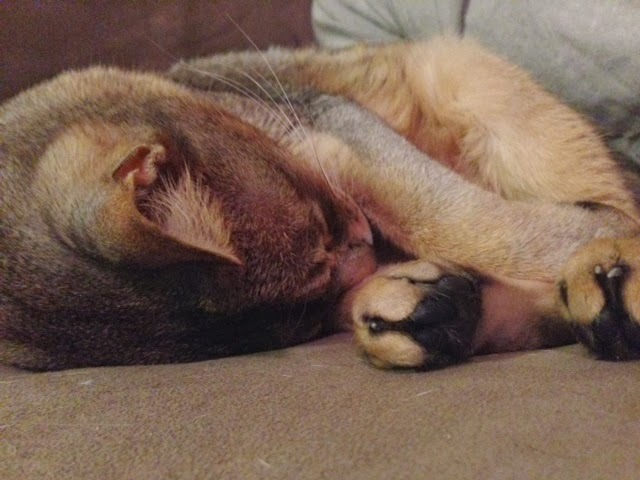 Daddy says my toes look like the black beans at Chipotle. Mommy learns about Legal Professionalism. Only the tip of Ishmael's tail misses Mommy. The rest of his body clearly does not; he is taking up her entire couch cushion. Refusing to let a piece of iceberg go to waste, Ishmael quickly fashioned himself a fresh cap. "The kids are saying phresh," he tells me. Ishmael gets tucked in next to Mommy's head every night. 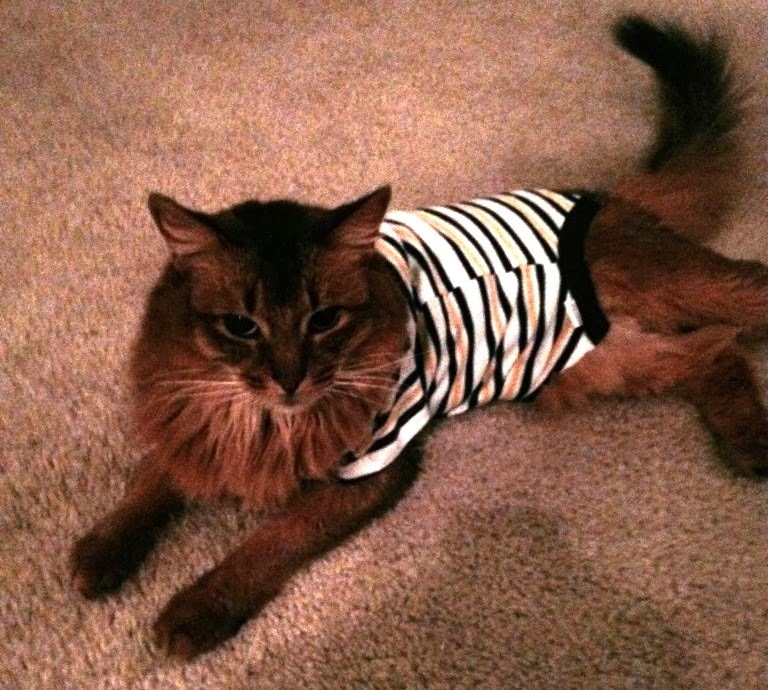 He would prefer not to show everyone what his pajamas look like. He knitted them himself out of sheepskin that he harvested from his friend Bartholomew. When Ishmael gets out of the shower, he likes to lounge around a bit before facing the day. Rajah is Ishmael's colorful younger brother. He caught wind of Ishmael's accessory fad. As usual, he took things too far. 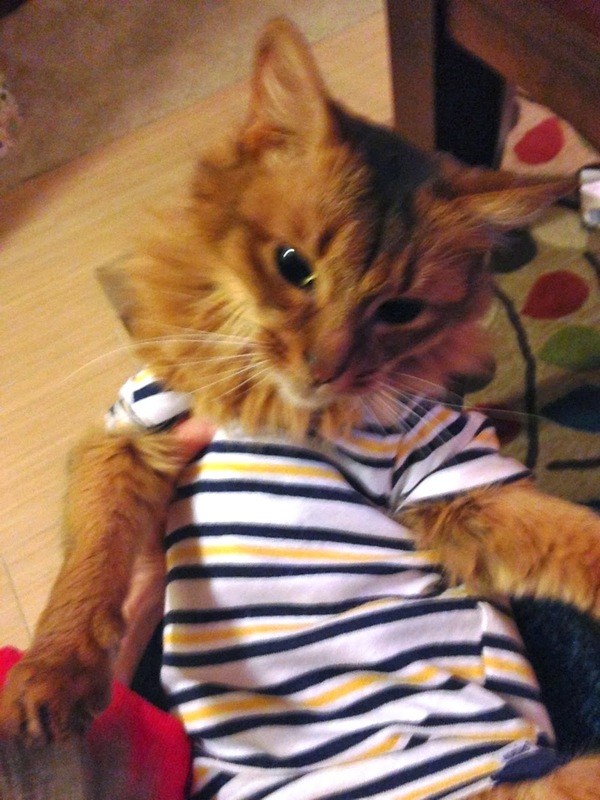 He wriggled into a onesie meant for Baby Na. Ishmael, this look is so 2009. Lately, the household has been enjoying the Hell on Wheels series on AMC. I have not seen one bandanna on the show. Sometimes, Ishmael does not feel well. He feels better in the safety of his cone hat nest. And even better when Daddy puts the alligator on the wall. Ishmael does not understand the fuss over finals. "child's play" (his words not mine). "I've always been the teacher's pet," he smirks. Brrr. Even with his thick undercoat, Ishmael gets cold sometimes. 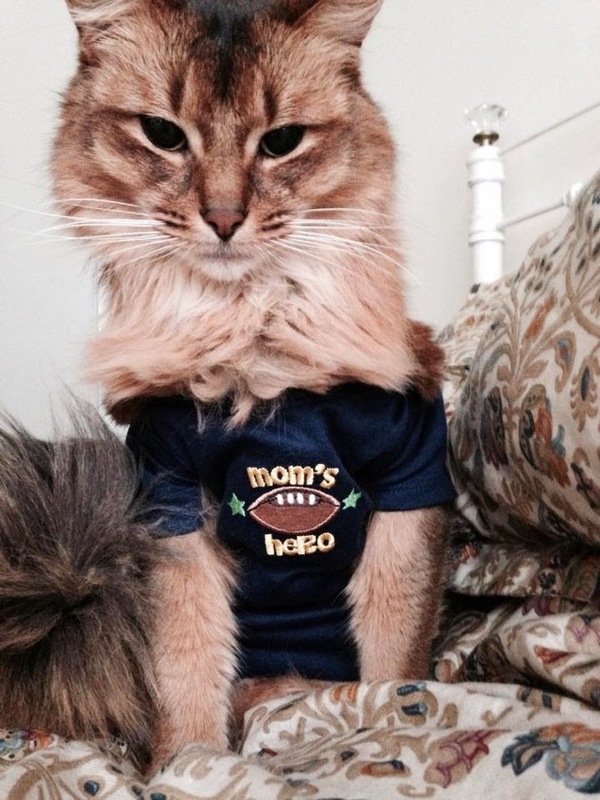 He did not mind bundling up to go to the Ravens game this weekend. He was invited to the suite, where he stayed warm with fried chicken and soft pretzels. I told Ishmael he was not invited to Willard Thanksgiving. He considers this a wild injustice. I asked him why, thinking it was because the dogs wereinvitedandhewasnot! He said, I've made myself a cornhat in anticipation of attending. Ishmael feels more comfortable cheering for the Ravens while wearing his handkerchief. but he thinks the luck will turn any day now. Justin came home from work early one day. Ishmael clearly was not expecting anyone to be home. He had wrapped this heart-pattern cloth napkin around his head. And was tidying the kitchen. All content belongs to Ishmael. Travel theme. Theme images by A330Pilot. Powered by Blogger.